Guaido, leader of the opposition-controlled National Assembly, in January invoked the country's constitution to assume the interim presidency after declaring President Nicolas Maduro's 2018 re-election a fraud. He has been recognized by the United States and most other Western nations as Venezuela's legitimate leader, and has said he does not recognize decisions emanating from the Maduro government. 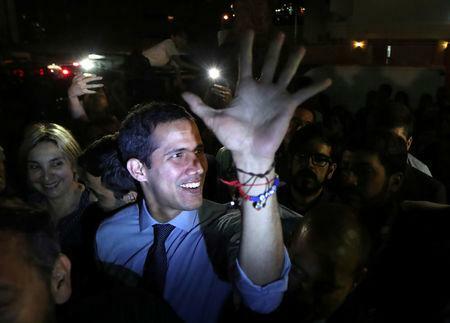 Venezuela's chief prosecutor's office has opened an investigation of Guaido, into alleged links to "incidents of violence" in January, but has not ordered his detention or officially charged him with any crime. "We are not going to evade our responsibility," Guaido told reporters in eastern Caracas after the announcement. "They thought this would be easy. But it won't be. If they want to move forward, they will have to assume the consequences." Constitutional lawyer Jose Vicente Haro called the decision a "constitutional fraud" that stripped Guaido of parliamentary immunity without the approval of the legislature, which under the constitution must approve such a decision. "It also violated due process, because he should have had a hearing to defend himself," said Haro in a telephone interview. Maduro has said Guaido should "face justice" and calls him a coup-mongering puppet for the United States - but he has stopped short of calling for his arrest.